The Kenosha Community Foundation is now on Instagram? On Instagram, we will be highlighting the Foundation’s work, projects, and events including: #SculptureWalkHarborPark, #HarborParkJRP, and #LincolnParkLive. First postings involve recent photos of the “Free to Fly” sculpture – its temporary installation in Civic Center Park is a project that we are proud to have sponsored – click here on the link to view one such posting. The mission of the Kenosha Community Foundation Arts Fund is to encourage and enhance cultural life and public art in the Kenosha (WI) area through facilitation, recognition, and financial support. The Arts Fund initiative is a sculpture walk consisting of a two-year installation of sculptors’ work for which each artist will receive an honorarium of $2,000. The Kenosha Community Foundation Arts Fund is soliciting artists for the 2017-2019 Sculpture WalkHarborPark Exhibit. HarborPark is located along Kenosha’s active lakefront. This area is home to parks, beaches, harbors, local cultural amenities and events, an upscale residential development, local businesses, restaurants and Kenosha’s historic business and municipal district. An existing pedestrian promenade accommodates the placement of the Sculpture Walk project. The promenade meanders through HarborPark providing brilliant views of Kenosha’s harbor, Lake Michigan, and various amenities of the area. The sculpture walk adds to the scenic walk offering residents and visitors a pleasant, cultural experience. The art sculptures are enjoyed by thousands and provide varying views of the landscape throughout the four seasons. The HarborPark-Sculpture Walk allows opportunities for artists to exhibit their work in a unique setting year round. endangerment to the public. The committee reserves the right to inspect all pieces and instruct the removal of a sculpture if the committee feels it presents any hazards. HarborPark offers the opportunity for a variety of sculptures. Life size and/or monumental sculptures of varying sizes are recommended. The public art will be mounted on square, concrete foundation slabs measuring 6’x6’ or 10’x10’. The piece must be structured so that the concrete slab is capable of supporting the art. Selection of sculptures and sizes may be dependent on the available sizes of foundation slabs. Sculptures must be ready for outdoor installation with a minimum mounting system of no less than 3/8” bolts and no greater than 3/4” bolts. A minimum 3-point bolting system is required. A template board with exact bolt locations is required and must accompany sculptures. Please indicate if you cannot provide your own drill equipment or power tools for installing and de-installing the sculptures – assistance may be available. Crane equipment for lifting and setting sculptures will be provided during installation and de-installation. To accommodate interested parties, all pieces must be available for sale. The Kenosha Community Foundation Arts Fund will collect a 20% commission on sculptures sold during the period of the exhibit. The artist’s name, title of sculpture, material of piece, year the sculpture was created, and sponsor of the sculpture will appear on a recognition plaque mounted on the base of the concrete foundation slab. Sculptures will be located on the walk for two (2) years. Artists are responsible for delivery of and the removal of their sculpture at the expiration of the exhibit. If sculpture is not removed upon removal deadline, the sculpture becomes the property of the Arts Fund. Details of installation and removal dates will be submitted upon selection of art and artist. The 2017- 2019 Installation is expected the mid to late September 2017. $500 at the start of the second year of the exhibit. $500 upon de-installation of the sculpture. Please note: Final payment will not be given until sculpture is de-installed from the exhibit. Each artist will be under contract with the Kenosha Community Foundation Arts Fund for the duration of the exhibit. Selected artists are responsible for transportation to and from the site, and are required to be on site to oversee installation. Application Deadline: Midnight, March 15, 2017 – Midnight, April 17, 2017. The Arts Fund reserves the right to update or revise the schedule as necessary. A selection panel composed of community members and facilitated by the Arts Fund will choose the finalists. Selections will be presented to the City of Kenosha review boards for final approval. Artists will be contacted once the decision has been made in a timely fashion to allow for planning of installation of sculpture. The Sculpture Walk – HarborPark 2017-2019 Exhibit Application Form (follows the Call for Art) including required supporting information must be received by midnight, March 15, 2017 Midnight, April 17, 2017. We look forward to your submittal! 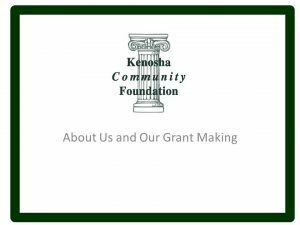 The Kenosha Community Foundation is now accepting grant applications local not-for-profit organizations for 2017 grants to be funded from the Unrestricted Funds that it manages. CLICK HERE FOR THE WORD VERSION OF THE APPLICATION FORM. CLICK HERE FOR THE PDF VERSION OF THE APPLICATION FORM. Applications must be received by the Foundation no later than 4 p.m. Friday, February 24, 2017. Grant awards will be announced in June 2017. 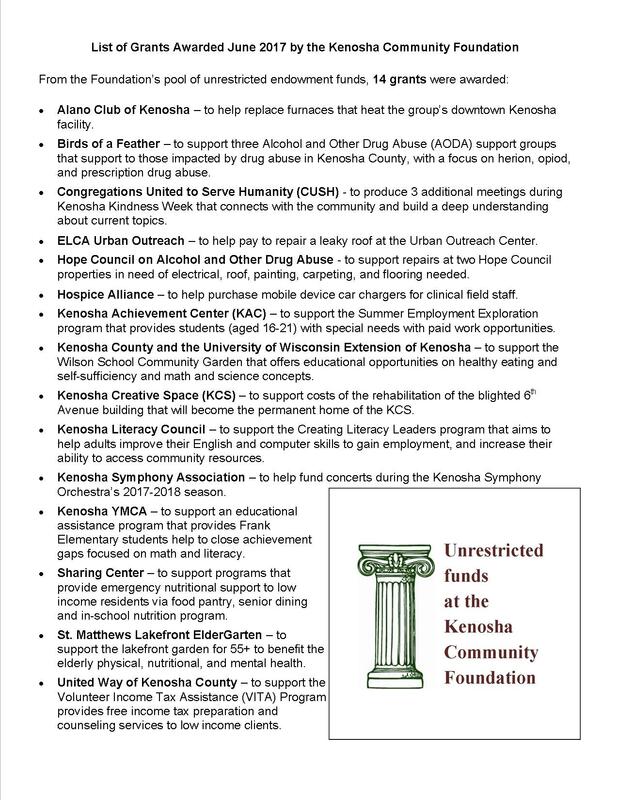 For 2017, the Foundation has adopted a new the focus for grant making from the income generated by our pool of Unrestricted Funds to support the project or program of a not-for-profit organization that are in line with the Foundation’s mission to enhance the present and ensure the future of the Kenosha Community. • Fund new projects from not-for-profit organizations that enhance the quality of life for the residents of Kenosha County. • Encourage project requests from fledgling (three years or less in existence) not-for-profit organizations. • Give priority to collaborative efforts, with two or more organizations jointly planning and delivering projects that offer creative solutions or ideas. • Give priority to projects that use Foundation funds to leverage other funding sources. • Award a maximum of $7,500 per grant request. In 2016, the Foundation awarded 9 grants, totaling $50,000, from these funds; the average grant was $5,555. Questions about the Foundation’s new focus and criteria for Unrestricted Funds grant making were reviewed at a community discussion on January 19, 2017. For copies of the slides presented at this discussion, visit the Foundation’s Facebook page or contact the Foundation atemail@kenoshafoundation.org. On August 18, the Kenosha Community Foundation held a public meeting at the Kenosha Public Library’s Southwest Branch to answer the questions that we receive about how we operate and make grants. If you missed the session, click HERE to view a PDF of the presentation that covered: what a community foundation and its three functions are, how charitable funds work, the Foundation’s charitable funds that make grants, our grant review process, and the new 2017 grant making schedule.